Happy 2014! Today I have some Sally Hansen Salon Effects to share. These were sent to me for review. When I first started getting into nail polish in 2010 I was addicted to the salon effect nail strips. Mainly because you get instant gratification with nail art without all the mess that comes with doing it yourself. 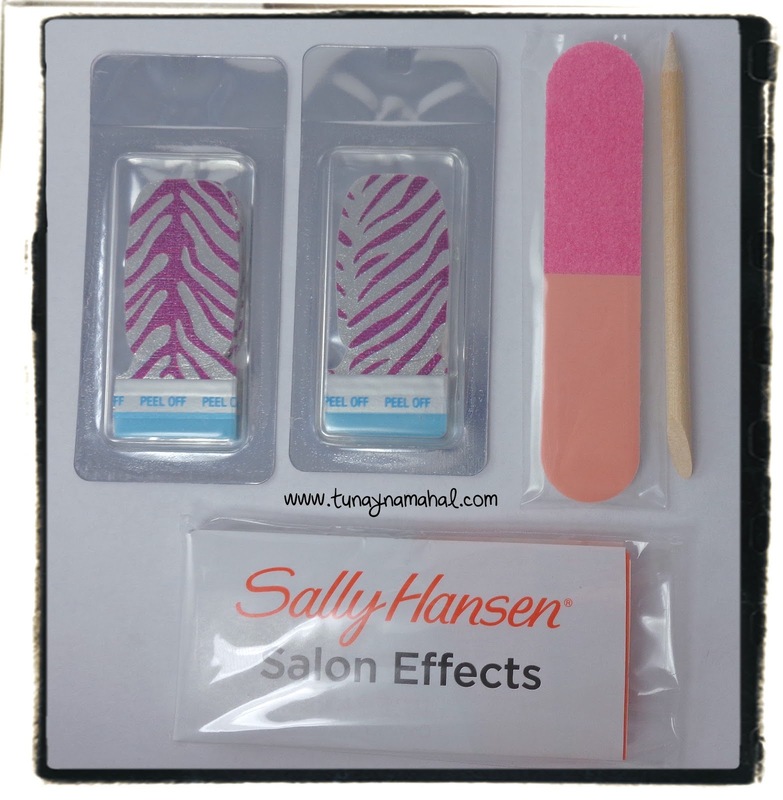 Sally Hansen salon effects are real nail polish strips that last up to 10 days. You can remove them with regular nail polish remover. They are available in 24 designs and you can find them at mass retailers and grocery/drug stores. They usually retail for around $7.99, but I've seen them for as low as $5.00 at Five Below. Salon Effects are perfect if you don't like changing your polish often or if you have a special event to attend and want to have some nail art on your nails without all the work. In each Salon Effects kit you get 16 nail polish strips in various sizes, plus a nail file, orange stick and directions. You pick out the nail strips that fit each finger best. You don't have to worry too much about messing up because if you align it wrong, just peel up the strip and try again. Once you align the strip, press it down with a firm rolling motion on your nail until it's completely covered. You use the included file to file off the excess around your nail tip. 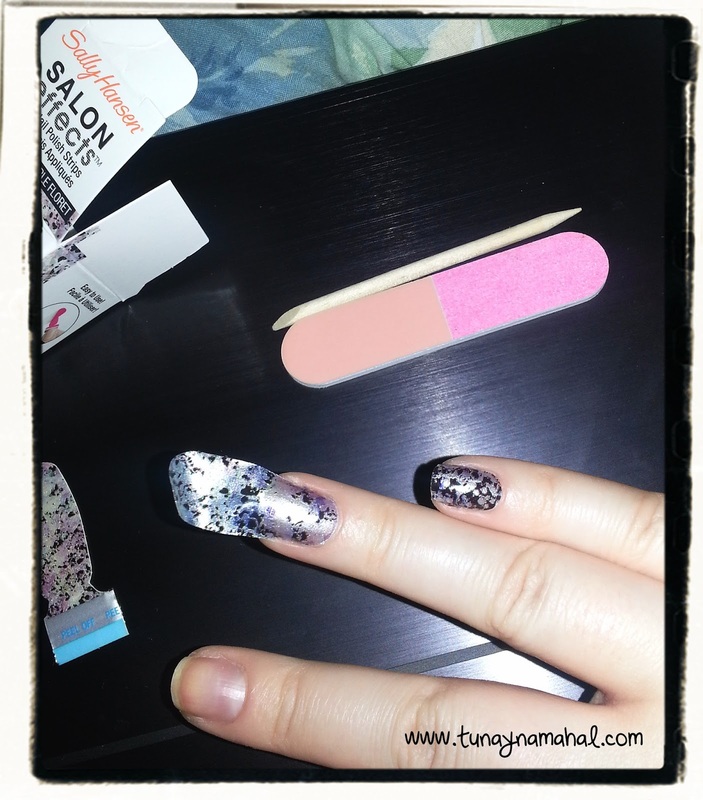 Use the orange stick to press down the strip around your cuticle and nail sides (use the flat side), doing this step helps the strips last longer. If you've never applied the strips before it will probably take you a good 30+ minutes to do both hands. Once you get the hang of it you can do both hands in 10-15 minutes. 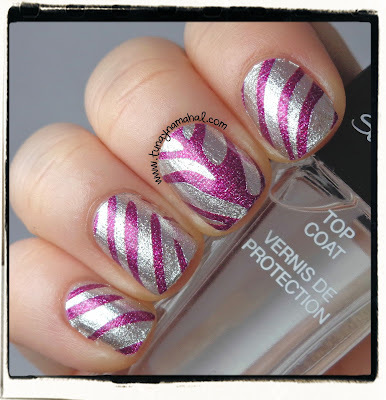 Apply 1-2 coats of clear topcoat once you're done applying the strips. This step isn't necessary, but it will help the strips last much longer. It may be body chemistry, but I've gotten almost 2 weeks of wear out of the Salon Effects by using a clear coat. There will be some tip wear, chipping and growth after 1 week, but you can stretch out the wear time by using a topcoat. NOTE: If you purchase these please check & make sure you have two of the foil strip packs in each box. The boxes aren't sealed & some people have gotten home to find someone stole the other foil packet. This almost happened to me at Walmart once. 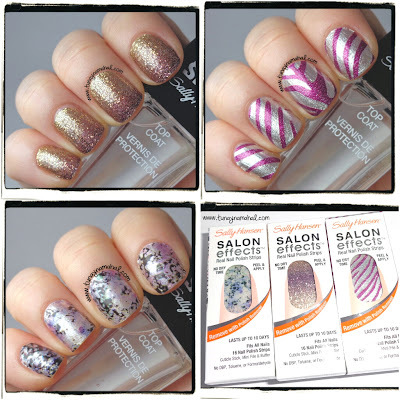 What do you think of Sally Hansen Salon Effects? Have you used them?